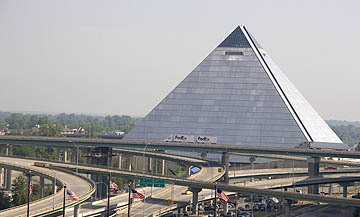 The Pyramid Arena in Memphis was built as the “mother of all convention centers” to attract sports teams, national exhibitions, and lure visitors to the Blues City. Apparently it isn’t hooking enough visitors and the silver pyramid is about to become a garish super store the likes of which has never been seen– a BASS PRO SHOP! That’s right. Plans call for a top water casting plug-shaped “incline mobile” to haul visitors to the top for a view of the city and the nearby Mississippi River. They will most certainly have a casting pond and sell fishing boats, all under the four roofs (no walls) of the pyramid. When the GUARDIAN visited recently and inquired about the structure, residents mostly shook their heads. Some were actually proud that it was about to become a famous retail outlet, but their neighbors across the river are proud to have inflicted Wal-Mart on society as well. If the Greater Boise Auditorium District (G-BAD) Boys continue with their obsession to build a convention center piece-meal beginning with a hole in the ground, they may want to look at the new Cabela’s store as a back up plan. A good fishing hole may be a prime attraction downtown. Gee, I thought we already had a good fishing hole downtown. (It used to be called the Tower, I think; then it became known as The Hole or The Eyesore). All it needed was water — and a few fish. Actually, a pyramid usually is a place to put dead kings, but perhaps we could use it for dead politicians … heck, they might like that idea so well some would even be willing to get dead sooner instead of later just so they could get entombed like Egypitan royalty. GBAD is leading us into an arms race we cannot win. The convention business is not by any means a growth sector according to a report by the highly-regarded Brookings Institution: http://www.brookings.edu/metro/pubs/20050117_conventioncenters.htm and yet Boise and lots of other mid sized cities want to spend millions on facilities to compete for a bigger slice of a pie that is not growing. I tried to get a group to consider Boise as a destination and they would not-for two reasons- neither of which had anything to do with a convention center. First airline tickets here are too expensive and you have to drive 6-8 hours at almost $3 bucks a gallon to get here. Remember folks – we are competing with LAS VEGAS (cheap rooms, cheap airfare, ceap food) for conventions – – and guess who wins! One thing becomes crystal clear to me as I read the statements of opposition to a new, or expanded, convention center for the city of Boise – those voicing the strongly worded opinions all seem to be driven by fear that the government is somehow trying to pull a fast one on the taxpayers and the taxpayers will end up paying for the “sure-to-fail” project through higher taxes. It is a fact that opponents of the effort misled the public when they implied taxpayers would eventually end up paying higher taxes “if” the convention center ended up losing money. They did such a wonderful job of hiding the truth and spreading the misconception that the ignorant masses elected the chief spokesman for the opposition to the Idaho Supreme Court! That was a pretty darn amazing thing to witness and should be the subject for books and movies about how the media can be used to make American citizens do pretty much anything you want them to do these days. I won’t waste much time on the issue of the GBAD’s lack of taxing authority, but I would encourage the ignorant to do some research on that topic. I would like to bring you attention back to a statement made by another man who misled the thinking-challenged into believing he represented a large group of people who belonged to something called the “Idahoans for Tax Reform.” Laird Maxwell IS that “group.” More than once, he actually uttered these words: “There is no law that prohibits the city or county government from bailing it out.” Does anyone out there realize what an insane statement that is? Unfortunately, nobody from the Convention and Visitors Bureau of the Auditorium District, or any other organization was out there screaming about the misrepresentations being fed to the voters, pointing out that GBAD has NO TAXING AUTHORITY. I don’t have any either and you know what? If I fail to make my house payment, there is no law that prohibits the city or county government from bailing me out. Never mind that it wouldn’t happen…just listen to my rhetoric and be afraid, be very afraid. Finally, to the one who felt obliged to post the Web address for Heywood Sanders’ ridiculous “report” about how convention business is dying in this country, here are a few “truthful” reports, using facts instead of rhetoric, to show why the cities all over this country are building and/or expanding convention centers in hopes of coming out winners in the competition for the $40 to $60 Billion in convention/meeting business that exists in any given year in this country. The fact is, Boise is poised to be a leader in the competition for convention business. Someone said we’re losers because people have to drive 6-8 hours to get here with gas that cost $3 a gallon. Sounds like more of MR’s Maxwell and Jones’ work. You can fly to Boise from virtually anywhere in the USA today and the fact that it’s more “remote” than many of the other places competing for the convention business is exactly why we have, or should have a huge advantage. People smart enough to be planning conventions, are also smart enough to know that Boise is a much more appealing place to spend a few convention days that any of the large cities in the West. Or East for that matter. EDITOR NOTE–Convention center proponents have continued to whip a dead horse on this one. We haven’t seen or heard any “disinformation” printed or otherwise. The Idaho Supreme Court has ruled that G-BAD used public money ILLEGALLY to promote their planned center. G-BAD simply violated the law–and public trust–buying ads and brochures with the CITIZEN’S MONEY advocating a yes vote. Well I did look at those reports and they do raise some valid points about the Brookings studies, but far from a smackdown. In fact, the information in those studies are hardly a ringing endorsement for plunging further into the convention business. Terms like “mature industry,” and “loss leader” are evident, and then the data itself is rather sobering. And this is coming from ceir.org, dksa.com, hvsinternational.com & pcma.org all of which have a vested interest, and not your dispassionate 3rd party. At least they didn’t take the same approach as a bunch of tobacco industry hacks, so that was refreshing. I’m usually sympathetic to government spending initiatives (libraries, schools) and believe me, no Laird Maxwell disciple. I just think with the GBAD proposals floated so far they have a very weak case based on the overall trend in the industry. I also think the site between 11th/13th and Front/Myrtle leaves a lot to be desired. G-BAD, as you like to call it, and the City of Boise have a steadfast policy of 50% deposit down at the time of contract, even if the contract should be for an event 3 years from now. This makes it vurtually impossible for small events to grow and generate new business. Instead, old established events and coporate sponsored events are relied upon to bring in the revenue. Using this kind of business, there is near no possible way for the new convention center to prosper in additon the the Boise Center On The Grove. I, personally, run a small event and it’s probably going to stay that way because of the downtown management. We would generate almost 1000 more hotel room nights than the 200+ we already use and be able to cover all of our costs, but have no way of coming up with the required money fof the deposit. The City and its organziations should worry more about developing new growth at the risk of losing a couple thousand dollars on a local organzation than risk losing millions on a convention center paid for by the vistors staying at the g-bad’s hotels.